When I find the perfect product that is a must have in any craftroom, I love to share it with you and give you the option to purchase it from me!!! 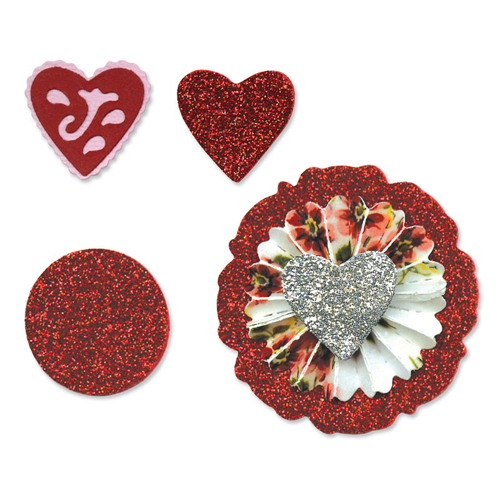 While on my show tonight, I demoed the new Sizzix Vintage Valentine Die. This cute die set is perfect for those that love Rosettes!! This die makes \ little Rosettes that are perfect for cards, ATC's or anywhere you need to add just the Perfect Little touch!! DETAILS:Individually packaged and value-priced, single Sizzlits are the ideal creative mates. Designed to cut a single sheet of cardstock, paper, metallic foil or vellum, the dies are simple to use, compact and portable for creating at home or on the go. Use it to add an extra touch of fun to all of your creative works. This Sizzlits 3-Die Decorative Set showcases the lovely signature style of Scrappy Cat. Each medium Sizzlits die in this set measures approximately 3 3/4" x 2 1/2" x 1/8" thick and is compatible with the BIGkick, Big Shot and Vagabond machines (used with a pair of Cutting Pads and the machine's included Platform), as well as the Sidekick Machine (with a pair of Cutting Pads). All items sold separately. Approximate die cut size is 2" x 2" to 7/8" x 7/8"; 2" x 2" x 1/4" Assembled.